The Spacebuster will return to Brooklyn for Democracy Lab, a week long series of talks and workshops focusing on social justice and civic engagement hosted by the Brooklyn Public Library. 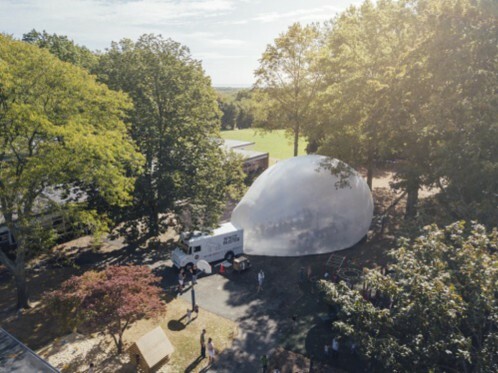 As part of 50 free programs over the course of the week, the inflatable dome will be the site of chair-making workshops, artist-led walks, and literary cabarets and debates. See the full schedule here. On June 12th, Storefront will host a special event at the Spacebuster as part of the New York Architecture Book Fair. The Spacebuster, created by raumlaborberlin and originally commissioned by Storefront in 2009, designed to explore the qualities and possibilities of public space in New York City. Read more about the Spacebuster and its past projects here.